On our Big Bend, in warmer months, slot-sized spotted seatrout tend to roam the grass-covered bottom from Yankeetown to St. Marks, feeding on pinfish, shrimp and just about anything that gets within range. That includes a myriad of artificial lures and baits, ranging from soft plastics rigged under popping corks to hard-bodied lures, retrieved with quick erratic twitches. I’m often asked about my “go-to” artificial baits and usually have a hard time coming up with an answer. “Glow” 3-inch D.O.A. shrimp are good, as are MirrOlure 52M18 plugs, but there are times when some stink is in order, usually when the water’s dirty or stained, calling for 3-inch new penny Gulp! shrimp. When winter arrives, don’t expect trout to stay on the flats, but understand that they head to deeper water, where they’re more protected from the cold. Of course, in recent years, it’s been difficult to predict the arrival of really cold weather, but it’s safe to say that December is a good time to change your trout-fishing tactics. If the water’s just cool, in the low ‘60s, and the days are sunny, trout will move into holes outside our rivers, but are wary of getting too far away from the protection they need on “ice-on-the-deck” days. On those very cold, overcast days, you’ll find them in deeper holes in rivers and creeks all along the Big Bend. When I refer to deep holes outside rivers, I’m not writing about random potholes that might be just boat-sized—or smaller. The holes I have marked personally are sometimes as big as half a football field and are usually not shown on charts. My favorites are ones I’ve found while exploring the coastline on lower water. Other areas with potential are the submerged beds of ancient creeks. Good examples of old creek beds are the “trenches” off Rock Point, north of Steinhatchee, or the “tongues” of deep water off Rocky Creek and Sink Creek, to the south. 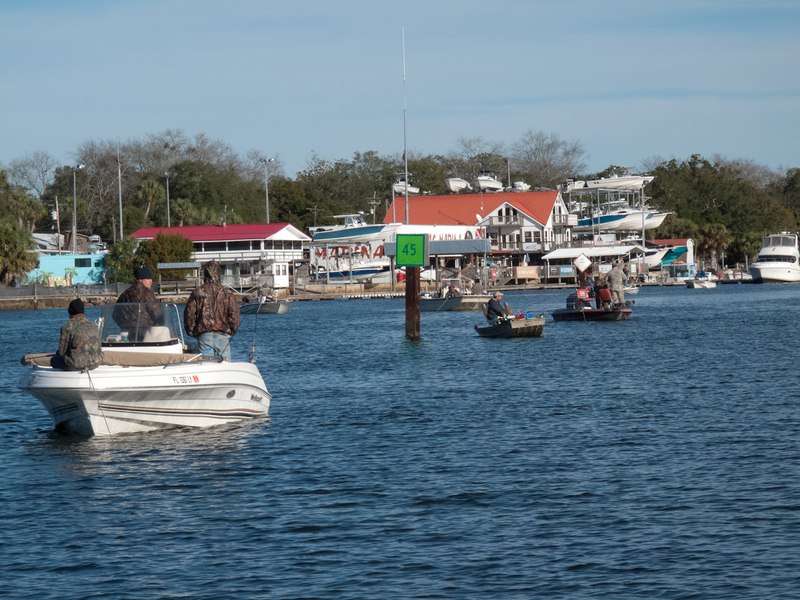 If you take a look at these areas, on your Florida Sportsman chart or in person, you’ll notice that they are surrounded by extreme shallows, where the trout venture on higher, sun-warmed water. But it’s those deep spots that offer quick cover when a sudden cold snap hits. Steinhatchee’s “Suicide Hole”, where seatrout go to commit suicide in the wintertime! When it gets really cold, and stays cold, trout respond differently. It’s then that you can expect them to move into natural or artificial channels and huddle up along the bottom. 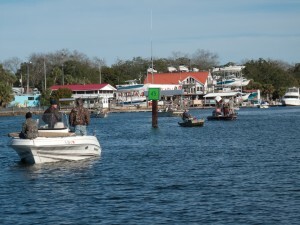 A couple of famous wintertime trout spots are the stretch of the Steinhatchee River near marker 24, the “suicide hole” just downstream of the Sea Hag Marina at Steinhatchee, and the Suwannee River between the canal to Miller’s Marina and the Salt River Cutoff. Knowing where cold-weather/cold-water trout are and getting them to bite are two different things. Cool water slows the metabolism of seatrout, but doesn’t stop them from being hungry. They’re just not willing to expend lots of energy chasing down a meal. That’s where slow-moving lures come into play. Yes, live or Gulp! shrimp pinned to a jig head will work, but my money’s on three lures: the red-backed holographic MirrOlure TT, the pearl/chartreuse Paul Brown Devil, or the redhead D.O.A. Airhead. Moving any of these baits as slowly as you can without snagging the bottom will give you a good chance of a hookup. 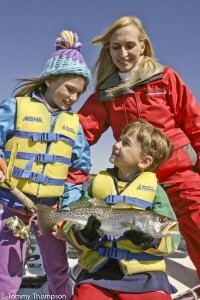 Big wintertime seatrout provide lots of fun–and good eats!–for the entire family. To casual observers, seatrout seem to have a mind of their own. But if you understand their need for warmth and pay attention to conditions and structure you’ll have an edge. Long cold spells will keep them deep and more willing to bite slower-moving offerings, while a stretch of bright sunny days will move them to the warmer edges of channels or holes, where they’re more active and less picky. In either case, catching a limit of wintertime trout shouldn’t be a difficult task for Big Bend anglers.